I believe the positions you hold are substantially clouding your ability to perform a true objective analysis on the markets. I used to live in Calgary but have since retired to Halifax. I retired from oil and gas working in the financial sector of the business. Justifying buying now is financial suicide and may show your youth and inexperience. Good luck to you. I’m doing some research on the Canadian housing market and one of your blog archives from feb 25 has a great graph. Would you be able to send me the excel data from this graph or tell me how you got the yearly home price data. I went to bob truman’s website and all I found was data for the last few years. I think the energy stocks will do better going forward compared to real estate simply because they suffered a more substantial downturn recently and as investments have better potential through dividends and growth. Are you concerned about you exposure to both Calgary real estate and energy companies? There are some scenrios that could trash both of those investments. Maybe investing in some different region or investment class you would be more diversified. I think investing in energy is a decent hedge for renters with part of their down payment because if that investment were to tank it is likely that housing in Alberta would be cheaper anyway. The Credit Crisis is causing a massive Global Deleveraging and subsequent depreciation of almost all asset classes. Equities will obviously dive first, since they’re the most liquid, but other asset classes will soon follow (ahem, housing). Leverage drove some of the worlds largest investment banks to bankruptcy. It was the same leverage which drove oil to $149/bbl, and it was leverage which drove housing to unaffordable highs. Had I bought in Calgary prior to 2005, I would be comfortable. But as a first-time buyer I’m absolutely terrified to get in now. Leverage works both ways, and if I’ve got $400,000 working against me, that’s a hole I’d never get out of. I assure you, as the Global Deleveraging process unwinds, housing will come down with it. Besides, oil hit $74/bbl today and we all know how Calgary does when Oil tanks. I disagree with seekingalpha’s comments regarding your experience or age. Value is quite simply determined by earnings over the long term. If you take a conservative assumption that forward earnings (5 years plus) will be in line with current earnings (arguable), then current PE ratios are low by historical levels, and in my opinion certainly indicate a time to buy. This is sound reasoning. Great chart. You’re half right. The stock market has over-corrected, due to forced liquidations (margin calls). Judging by any reasonable measure: P/CF, ROE, etc. many sectors of the stock market, including, but not only, energy, are due for a bounce. 1 in 11 companies in the US now have a market cap. smaller than the company’s cash/marketables on hand. That is the same level the market briefly hit at the bottom in 1932. OTOH, I disagree with the analysis of housing. The US housing bubble has not fallen faster than the dot-com bubble. That peaked in March 2000, and hit bottom in Sept. ’02, so 2 1/2 years. US housing peaked in Oct. ’05. It’s now 3 years past the peak, and we still aren’t at the bottom, Compare median home price to median income, and house prices still have a ways to fall, especially when median income slips during the recession. Personally, I think waiting 5 months and then buying up every energy stock and index spyder you can get your hands on. For now the risk just isn’t worth the reward in the short term (stocks and energy) Then again I am conservative waiting for the market to flatline prime for an upturn. Housing Market, well, I think the median house still have 70K to go in Calgary. How are you with having others’ articles on your site? 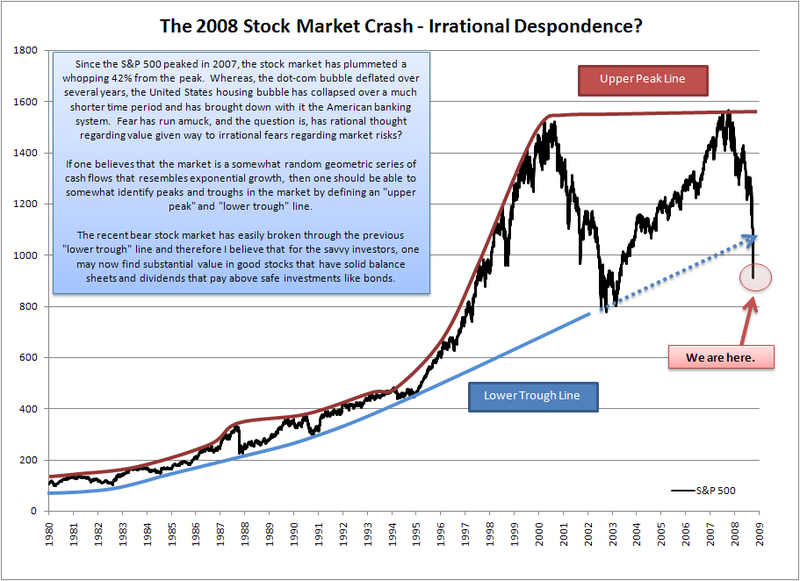 It’s nice to see others think this whole stock market crash has been overblown too. I’m sure it does/will have a slight effect, but most of me thinks it is more media driven then anything else. The whole stock market thing is a way to sell papers, I’m fully convinced of it myself. new reader. What could you suggest in regards to your submit that you simply made a few days in the past?